Welcome to the New Ulm Rotary Club! I hope your day is going great! On behalf of the New Ulm Rotary Club I would like to welcome you to our website. 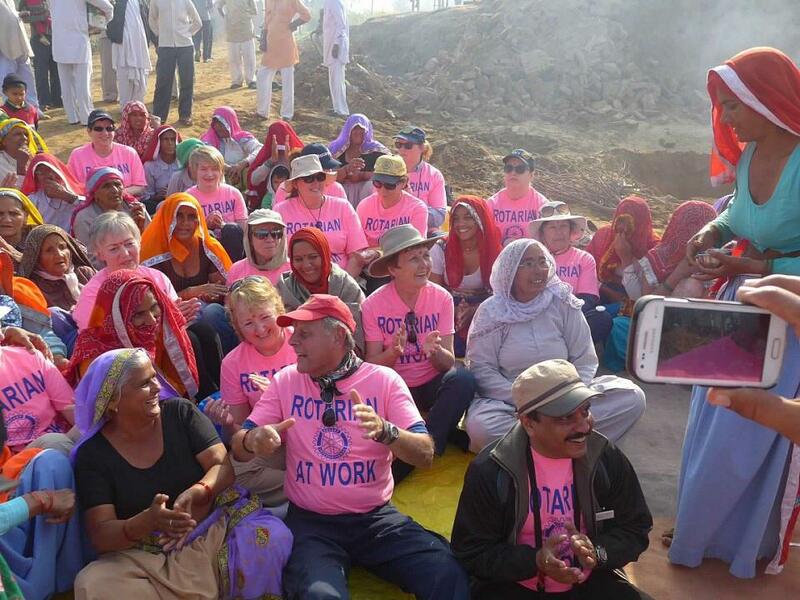 Here, you can read about our extraordinary work in the community as well as what Rotary is doing worldwide. Our New Ulm club was organized on July 1st, 1938 and is now a vibrant 78 years old! All of our members are very active in the community and we continually seek new ways to enhance our contributions to better the lives of those around us. Take a moment to browse our site. I am confident you will like what you see and hopefully become interested in joining our club. If you are interested in joining or even just attending a meeting let me know. Just click on my name in the Club Executives and Directors section to send me an email. I will get you the additional information you need. Have an excellent day and never underestimate the good you can bring to others! 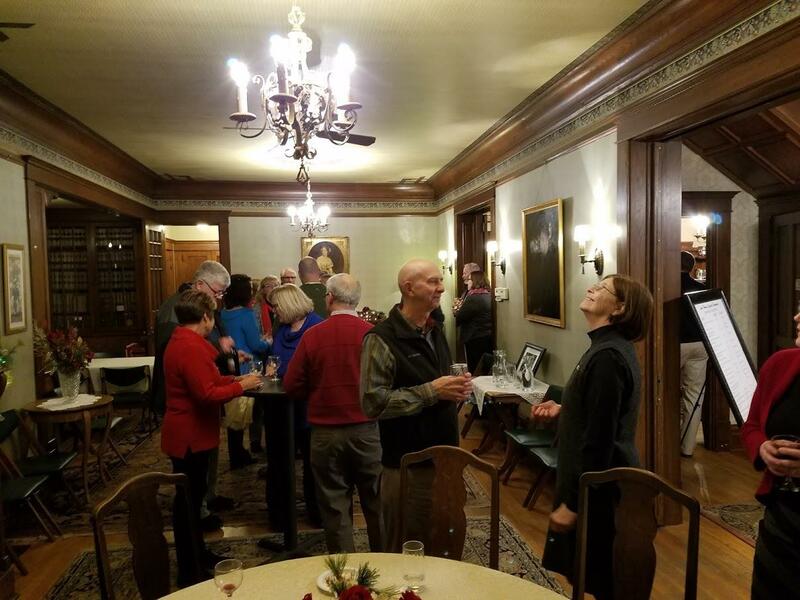 On Wednesday December 21st many of our fellow Rotary Club members joined together at the John Lind House to celebrate Christmas and the holidays. It was pleasing to see so many members and theirs guests attend the event. We had roughly 45 people at the party. The catered food was excellent and the conversation even better. Ric Jacobson even brought a nice variety of his homemade wine. Ric's wine did not last long so I expect all of it was very good! Pastor Lisa Doege and Patty Paulson were our guests September 20th to talk about NUMAS Haus. NUMAS Haus was created by the New Ulm Ministerial Association, with a great deal of support from individuals, churches, service clubs and local businesses. Doege, pastor at Nora Unitarian Universalist Church in Hanska, is vice president of the NUMAS Haus board of directors. She said when NUMA began talking a couple of years ago about extending its ministry out into the community, the need for a homeless shelter became apparent. "All of our traditions, Christian, Jewish and Muslim, call for caring for strangers, widows, orphans and the poor," she said. 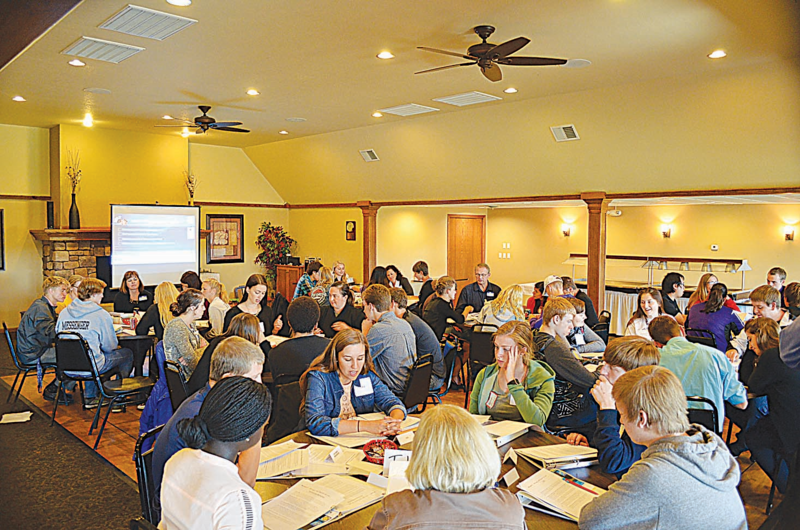 The group learned that there were 40 students in the New Ulm School District who were considered homeless. The group knew that tackling the issue of homelessness was immense, decided to start small and focus on helping single mothers with school-age children. The house provided was remodeled into housing for three families, and that project, started two years ago, is not complete with the first family already in place. Patty Paulson is the supervisor of NUMAS Haus. It is a job she is uniquely suited for, with degrees in social work and administration. The money donated was a joint effort between our District 5950 and our local members. The attached picture shows from the left, Pastor Lisa Doege, Patty Paulson, Jim Spoon and Pastor Ric Jacobsen. NUMAS Haus is the first shelter opening in the New Ulm area to provide temporary housing to young mothers and their children who otherwise have no place to go. Our club donated and set up furniture for one of the bedrooms upstairs. Kevin Sweeney, Aaron Lambrecht, Bob Reuter, Norm Kopp and Jim Spoon assisted in moving and setting up the furniture. 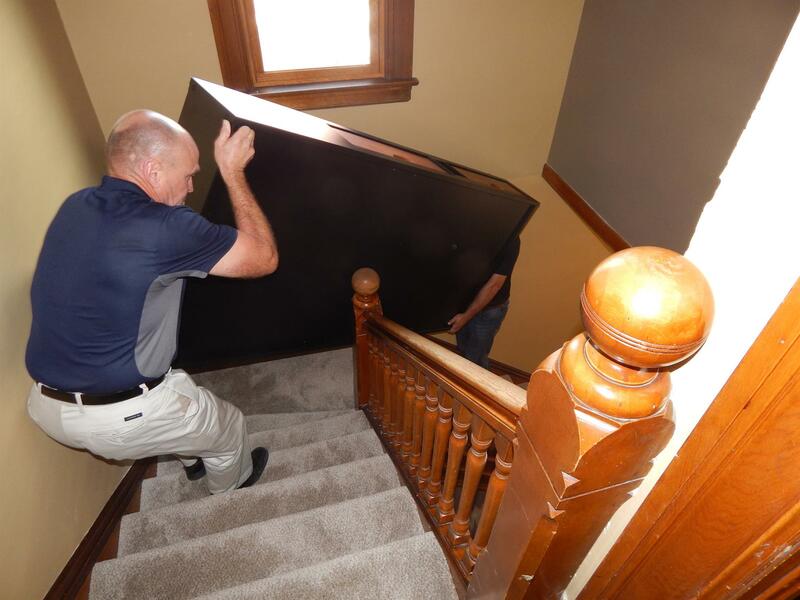 We found moving this furniture into and old house with narrow stairs was no easy task. You can see in the picture Bob and Aaron having "fun" navigating the stairs. We sure got our workout for the day! Rotary club members Donna Lambrecht, Phil Schenck, Jim Spoon, Marc Burkhart and Ric Jacobsen also assisted with moving appliances into the NUMAS Haus. All appliances in the house have been donated by our club. Our Club is so proud to be part of this renewed effort to help others in need in our community. 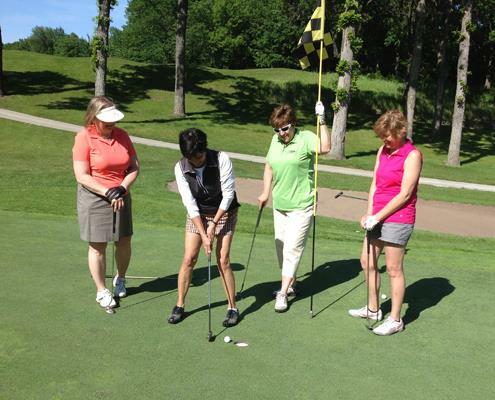 Deb Lentz sinks a putt on the 18th green during the Rotary golf tournament at New Ulm Country Club Monday, June 1. Looking on are Colleen Skillings (left), Julie Baumgartner (second from right) and Tori Gronholz. 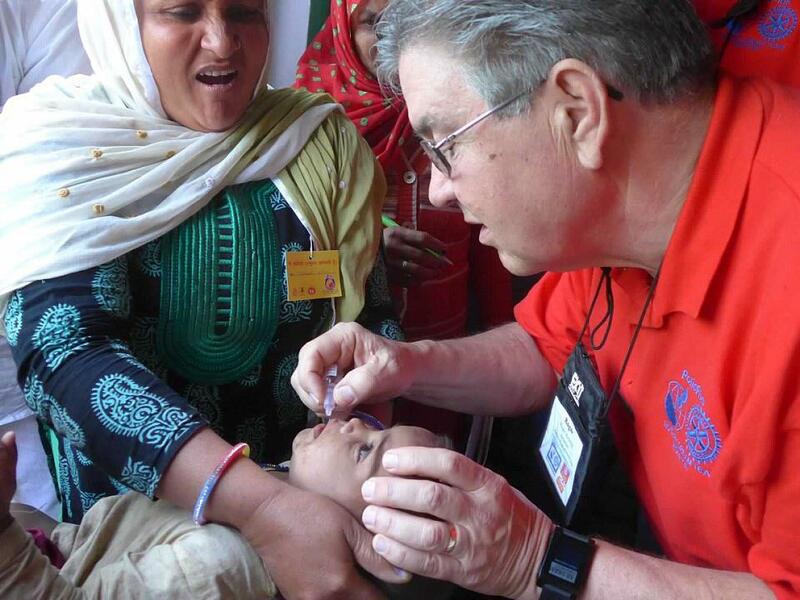 The annual tournament has raised money for a variety of Rotary causes over the years, from Polio Plus to the New Ulm Medical Center Surgery Project, to STRIVE, to the new Ethics Program that the Rotary Club sponsors for local high school students. 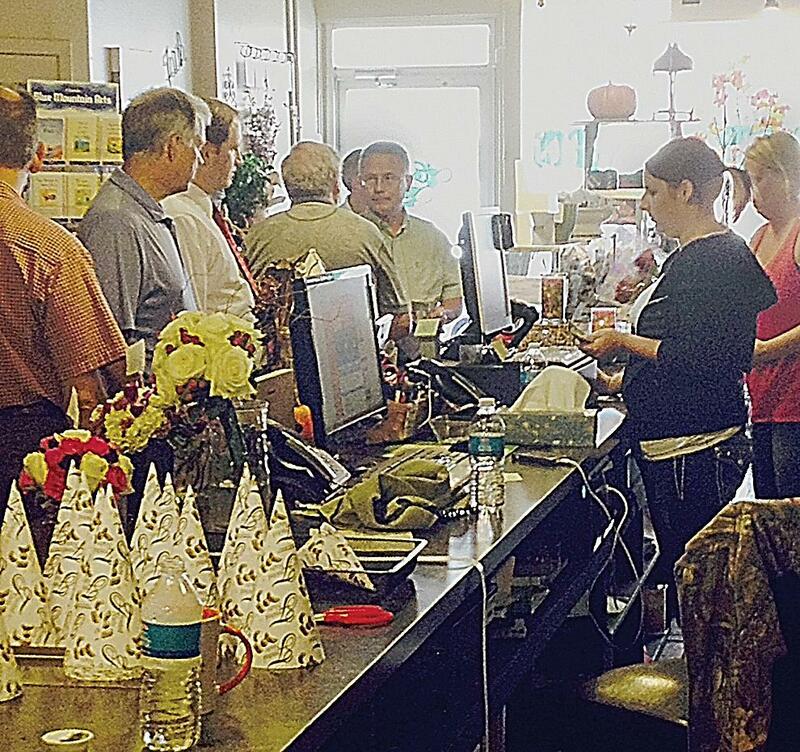 Members of the New Ulm Rotary Club pulled a “cash mob” visit at Hope & Faith Floral and Gifts on Tuesday, Aug. 19. The club had heard at its meeting Tuesday from Missy Marti and Jean Geistfeld about the “Go Local” program that Citizens Bank Minnesota has been promoting, to encourage patronage of local businesses. The bank’s employees have been holding “cash mobs,” descending on local businesses to spend $20 or so during the holiday season to help local businesses. 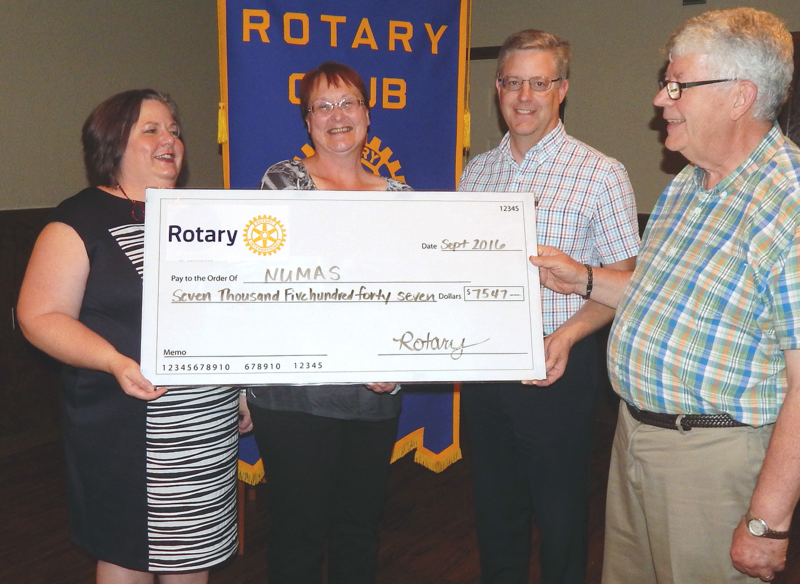 This year the Rotary Club of New Ulm turns 75 years old. The club was organized on July 1, 1938. Special events are being planned for a celebration in September. District Governor Diann Kirby will be visiting on Sept. 17 to present a commemorative plaque, and the club is planning to hold a "Business After Hours" reception. Details will be announced later. Congratulations to all New Ulm Rotarians, past and present. 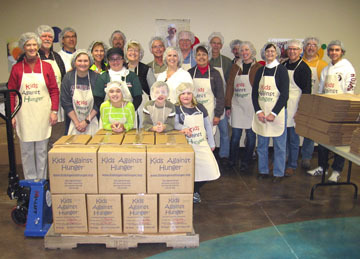 A group of New Ulm Rotarians, family and friends packed 9,600 meals for Kids Against Hunger at the Hope & Healing Center in New Ulm Monday night, Jan. 16. A District 5950 Community Action Grant and our Fast for Hope donations paid for the food that will be sent to feed starving children.